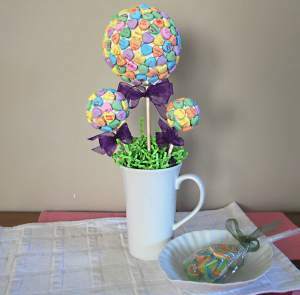 Decorative candy topiaries make great party centerpieces or home decorations for special occasions or holidays. Craft Glue to glue dowel in place. Small dish or mug if you want to let set after first half is complete before doing the other half. 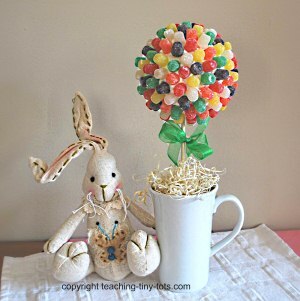 Holiday themed or colored candies such as conversation hearts, jelly bellies. Stick the dowel into the foam. Remove and squeeze some glue into the hole and push the dowel back in. Let dry. Place a large sheet of waxed paper or parchment paper on a flat surface. Pour/sort candies into small dishes or a muffin tin. Use the spatula to put a coating of frosting on half of the styrofoam.. Stick on candies. For best results let set for 30 minutes before completing the other side. Use spatula to put frosting on the rest of the styrofoam. Use a small butter knife to add frosting to a piece of candy if needed. This is not considered an edible project. 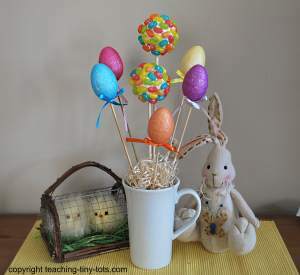 Please make certain your child does not eat the candies. 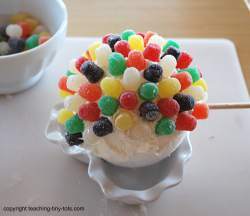 For best results use CAKE FROSTING to stick on candies. After testing Craft Glue, Wilton Icing and Frosting we found the Wilton Icing is good for flat areas and helps define where to place candies but for any sides, cones or non flat surfaces, use cake frosting. The candy with stick and NOT slide. If you choose to do a pattern, lay out the candies on the waxed paper. 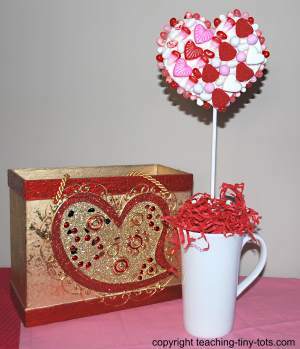 The heart will get surprisingly heavy with the candies so make sure you test stability. We added some glass craft pebbles to create a more stable base. At Michael's Crafts Store we found pre made shapes like circles, stars and hearts for one US dollar. Keep out of reach of very young children when displaying! It is very irresistible looking!